As a huge 2000AD fan I've been paying close attention to the ‘Worlds of 2000 AD’ Tabletop Adventure Game, coming soon from EN Publishing. I was more interested in how the material would be handled than the system they were going to use, but I've now spent some time having a read of the starter kit for EN Publishing's house rules, the 'What’s O.L.D. is N.E.W.' game system. 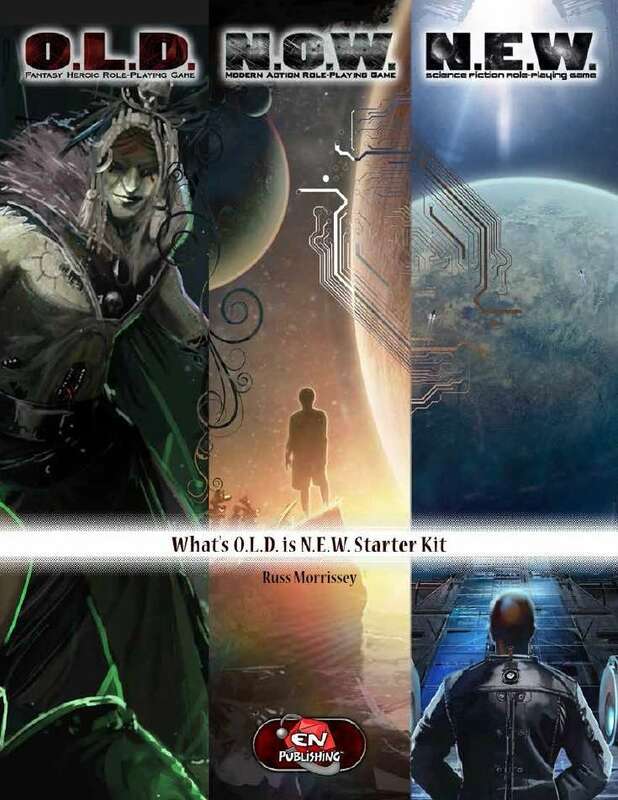 The handy starter pack is available from RPGnow and there's a supplement coming out that has me very interested called 'Xenomorphs: The Fall of Somerset Landing', which is running a Kickstarter at the time of this blog post (and smashed it's target). It's inspired by Aliens... well, I say inspired by, it is pretty much Aliens, but it looks like a fun game and certainly the kind of thing I'd like to play. The influences may be there, but it's how it plays that counts. And talking about things being pretty much like it's source material - I've had a read of the starter pack and I like the look of it. It does feel like a re-tooled version of the D6 System, one of my favourite systems of all time, and no matter how things are re-worded in the rulebook it plays in pretty much the same way. However, the idea of life-paths during character creation and the other additions sound like fun and are most likely something I'll like to tinker with. The feedback on the game itself has been positive and it's done well enough to get hold of the 2000AD licence so it's doing something right. I'll look forward to putting the starter pack through it's paces soon, and may even look at the core N.E.W. rulebook so that I can have a go at the Somerset Landing game. This is something I'll keep on my radar. Well, motion detector. Whenever I sit down to write there are four things I like to have happen, just to be sure that my head is in the right place for creating and that I'll be comfortable while doing so. 1 - Reference materials. This kind of goes without saying, but I do like to make sure that I have to hand the books I need and nothing more. There was a time, especially when I was designing Star Wars D6 adventures and stories, I would have as many books as I could possibly need stacked next to my desk. I had almost every WEG product published, so I'd have books about starships, bases, organisations, period details, characters... it was huge. The problem was, instead of just getting on with the writing I'd spend a lot of time flicking through different books to find details that I thought I'd need; it was a massive time waster. So now, I just have the books I really will need to hand and then worry about details once I've finished, usually during editing. One or two main books, that's enough. 2 - Food and drink. This isn't as weird as it sounds. I hate having to get up every now and then because I feel a bit thirsty or peckish. It's a small thing but it can be distracting. These days I have a flask and a packet of nibbles to hand so that if I do get into a flow I can minimise distruption when my stomach growls for attention. 3 - Music or ambient noise. If there's a bunch of whistling workmen outside with jackhammers, I'm not going to get much done. If I'm in a dark fantasy mood and someone is playing happy pop tunes loudly, I'm going to lose my focus. I either make sure that I'm not distracted, or I choose some relevant music to write by. I don't mind wearing headphones, although the little ear buds are much less distracting, but I'd rather not if I can help it. Having the correct atmosphere goes a long way. 4 - Being in the mood. If I watch the Star Wars trilogy and then immediately sit down to write a Fighting Fantasy adventure, I'm not going to be in the right state of mind. After watching the Death Star being annihilated - twice - I'm going to be buzzing on science fantasy and laserbolts and not general fantasy and spellcasting. I have to be in the right mood to write, and if that means spending time reading the rulebooks or source materials, or exposing my brain to the genre or listening to relevant music to capture the correct feeling then so be it. I have to be in the correct headspace to get things down on paper, which can be annoying at three in the morning when I wake up excited about a certain genre for no reason, but then I'm too tired to do anything about it. Of course, there is a fifth entry - stop writing blog posts and just get on with the damn writing. Fighting Fantasy Gamebooks were what got me into tabletop roleplaying games. I started with book 2 – ‘The Citadel Of Chaos’ – and played it to death. I’ve still got it, the cover all faded and the pages yellowed with age, the spine heavily creased and the centre of the pages smudged and marked by all the thumb-flipping I did. I was hooked on these books all the way through the 1980s, and when I couldn’t get a tabletop RPG on I’d turn to my gamebooks for my fix. I bought them all, even the ‘Sorcery!’ series and ‘The Clash of the Princes’. 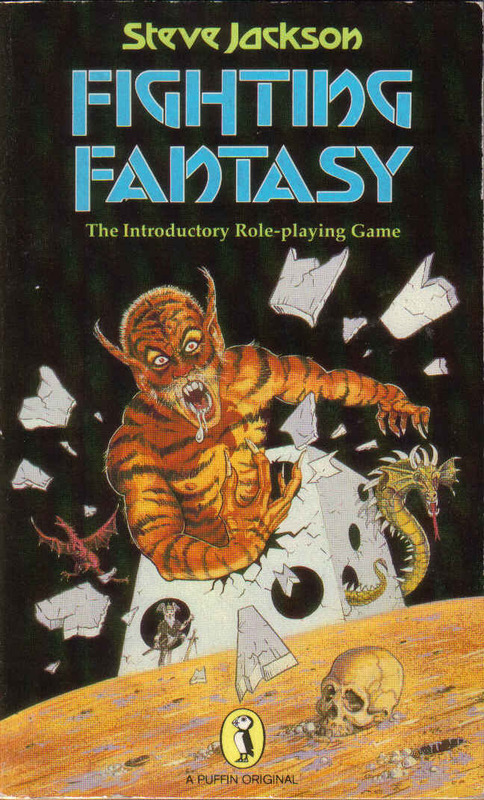 The gamebooks also gave rise to the introductory roleplaying ‘Fighting Fantasy’ and I have used this system to introduce new players to the hobby more than once. It’s not a great system. 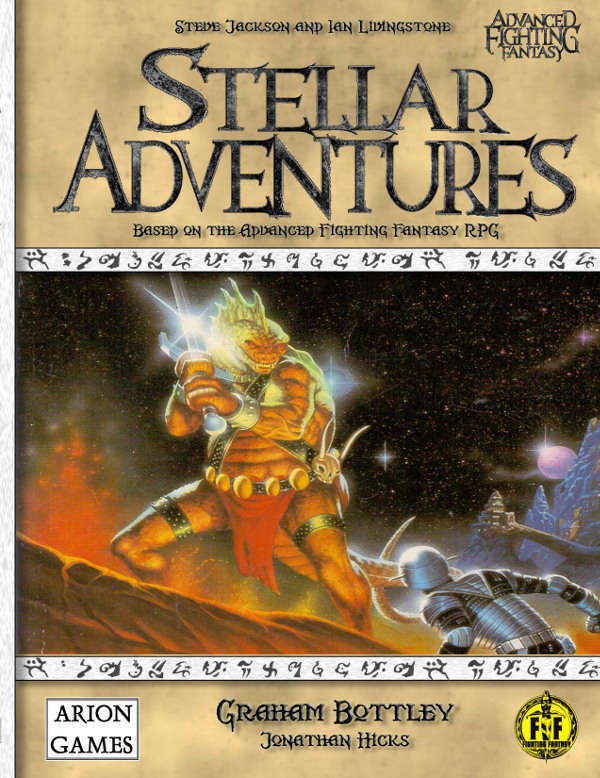 In fact, the later RPG editions that called themselves Advanced Fighting Fantasy were in fact a little broke, but for a beginning game it was perfect. The system has now been smoothed out and improved upon by Arion Games. The adventurers statistics, just as in the gamebook, were SKILL, STAMINA and LUCK. Skill and Luck were a number from 6 to 12 whereas Stamina (hit points, basically) was a score up to 24. Using two six-sided dice the game could progress at a tremendously fast pace. All that was required during combat was a single roll of 2D6 which would determine who won the round. Some actions were determined by the Skill level and a single D6 was used for other actions, a target number between 1 and 6 chosen by the GM depending on the difficulty of the situation. Luck could save a character’s life and help them out of sticky situations. It’s a perfectly simple system. The dice rolls were simple and you could resolve a battle with even a large group of characters in minutes. There were hardly any charts or tables to peruse and everything a player needed was listed on single sheet. 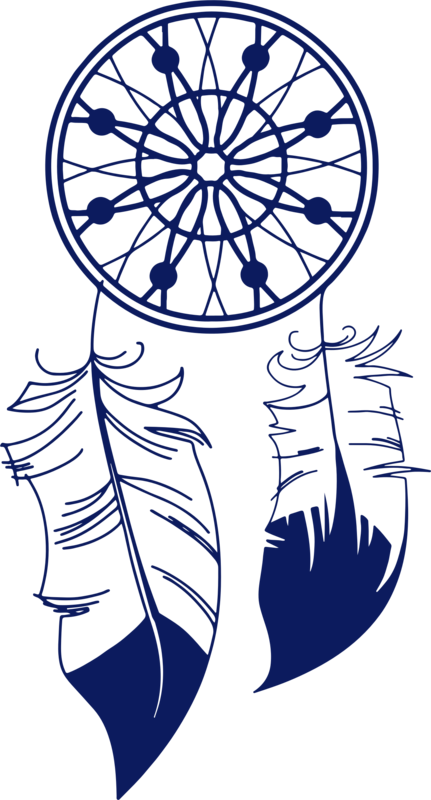 Pure simplicity and a rules-light fan’s dream. To accompany the system was a vast world that had been created and explored throughout the Fighting Fantasy gamebooks – Titan. Three continents covered a diverse range of lands, races and cultures. You could play the equivalent of a historical European Knight, a Samurai, a Pirate, a Viking… the choice was fantastic. There were monsters and bad guys crawling out of every corner of the world and it had a detailed history. Two books, ‘Titan- The Fighting Fantasy World’ and ‘Out of the Pit’ were filled with details, histories, monsters and locations and could keep you in games and adventures for weeks. There was certainly plenty of material to use and abuse. The great thing about the system is that you can take one of the gamebooks and use that as your setting, not just the Titan world. If I wanted spaceships I’d haul out my copy of ‘Starship Traveller’ and use the spaceship rules in there. Mad Max game? ‘Freeway Fighter’ fits the bill. 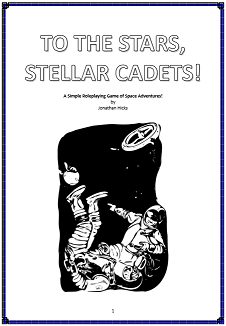 The gamebooks could act as little scenarios/sourcebooks in their own right. Titan, and especially the primary continent of Allansia, was ripe for plenty of high-fantasy adventuring yet the system itself did not really lend itself to long-term play. You could play characters for a long time but the limitations of the system did not really allow for advancement. What little advancement there was ended up being restricted by the system. Fighting Fantasy worked excellent as an introductory game but it was mainly a stepping stone on to other more detailed RPG games and systems. The world of Titan is an excellent place to adventure and rivals many of the worlds created for modern games, but it needs a system that suits it and allows for character advancement. The Fighting Fantasy rules are perfect for introducing new blood and they have a huge gaming world for budding new players to run around in, but I can’t help but think that the system is nothing but basic training before new gamers go out and discover newer and better RPGs. I still love it, though. I love the simplicity and it allows me to explain how game mechanics work in a rolepaying game without scaring anyone away. I’m not wielding a huge scary 600-page tome of comprehensive rules, I’ve got a little paperback with which to ease new players into the game. I’ll continue to use the Fighting Fantasy rules for new players, especially the younger ones, and I can highly recommend that anyone thinking of doing the same thing use these rules. 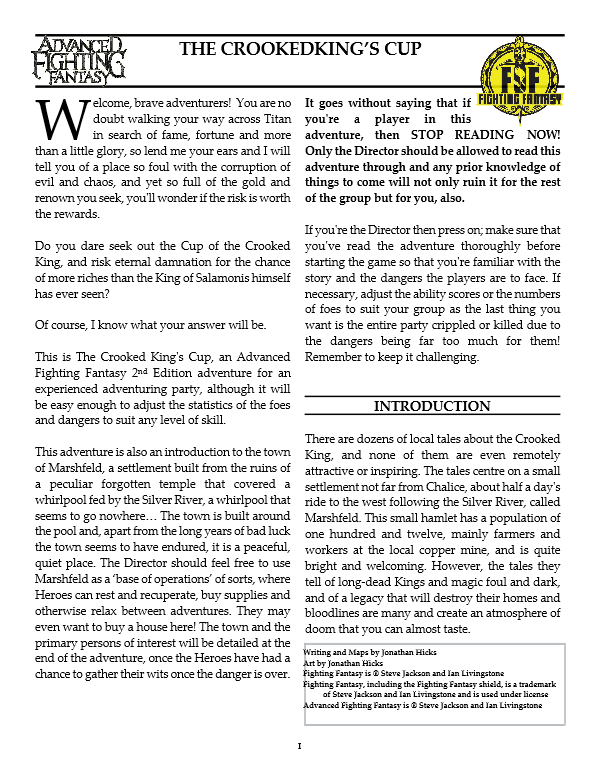 They've now been re-released by Scholastic, with new layouts and new artwork, so a whole new generation of gamers are there, waiting in the wings, and what better way to get them into the tabletop roleplaying than with a game of Fighting Fantasy - The Introductory Roleplaying Game. 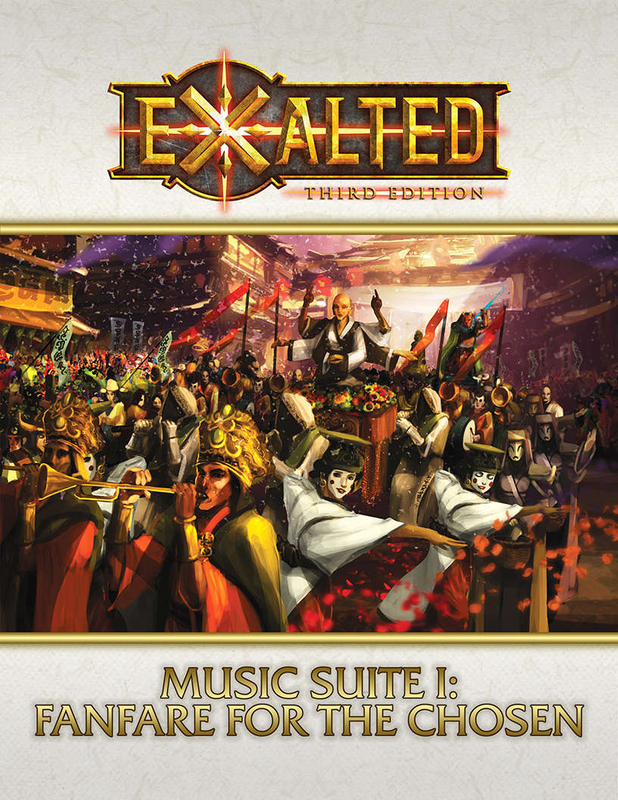 ‘Fanfare for the Chosen includes inspiring soundtrack themes for each of the ten types of Exalted (Solars, Lunars, Sidereals, Dragon Bloodeds, Abyssals, Exigents, Getiminans, Liminals, Infernals, Alchemicals), to set the tone as you encounter these Exalted in your games or are seeking inspiration for new stories. An epic game for an epic setting requires epic music. In the RPG Exalted, players take on the roles of powerful heroes in a world of entities with the power of gods, and the world will be shaped by their wars and whims. Using music in tabletop RPGs has been around for a long time, and I used to use music from movie soundtracks quite extensively during my sessions. If the game we were playing was licensed and I had a suitable soundtrack that could be identified with the setting then so much the better. Williams' ‘Star Wars’ music and Goldsmith/Horner’s ‘Star Trek’ OSTs got a lot of airtime in my house. Now there’s no need to match existing music soundtracks to the game you’re playing. Now games have their own OSTs, and one of the leading composers in this field right now is James Semple. James Semple has given us ten pieces of music to use in our Exalted games, each one acting as an introduction to a session or a scene. While not designed for ongoing play, like background incidental music, they are perfect for the scene-setting introductions that GMs love to do. With this music playing in the background as this week's scenario is introduced it turns each session into an episode, with the track as the title music. It helps set the scene, helps set the mood and, most importantly, it helps get the players into the adventure. Nearly a year went into composing, arranging and producing this soundtrack and it shows – the arrangements are of a high standard, with a huge orchestral roar bellowing out to the most rousing pieces. The production standard is excellent, well produced and is a polished recording of a very high quality. Return of the Solar Exalted : A huge orchestral piece, this track feels like the opening credits music to a huge fantasy show. Playing this as you recap the adventure is a great way to get back into the campaign. That can be said of any of the following pieces, depending on the mood you’re trying to invoke. These are the heroes of the game and deserved a rousing theme. Rise of the Infernal Exalted : Are you looking for a darker edge to this weeks adventure? Have the players just arrived at a dangerous location, or has a NPC with evil in their heart just walked on stage? This starts dark but still has an edge of urgency to it. The demons of the world drip with dark character. Birth of the Liminal Exalted : Although a softer track for those moments of relative peace, this piece still has a touch of mystery and danger, as if it lingers at the edges waiting to pounce. This represents the wondrous, tragic and doomed creation of these constructed golem types, complete with a heartbeat in the bass starting halfway through the track. The Alchemical Exalted – Ex Machina : Touched with an ethereal feel, this music marches like a clock, representing the mechanical, android side. This is almost entirely metal instruments representing these clockwork Exalts and nods to their almost Eastern Bloc state with a huge Slavic brass theme. The Getimian Exalted – War in Heaven : Quick, fast paced and steady, almost like riding a horse. This track gives us the passion and drive of these warriors. It’s more heroic than many would have expected representing their war against the gods and contrasting dark and light. Rage of the Lunar Exalted : Deep beating drums and horns lend power to this track, and gives us an excellent tribal feel to the game. The Abyssal Exalted – Death’s Lawgivers : Beginning with a powerful, religious tone and followed by the bell of what sounds like doom singing, this piece reflects tragedy and sorrow and, in fact, is my favourite piece. The Sidereal Exalted – Lesser But Safe : This would suit those games with investigation, calculation and confrontation. In fact, it sounds like the opening of a TV detective show and would be perfect for those games where roleplaying takes the lead. The Exigents – Power of the Exigence : The newest thing in Exalted gets it’s own track, and it even starts out unsure showing their humble, normal beginnings and then their true power revealing in a huge wondrous crescendo as the music grows in confidence and power. March of the DragonBlooded : Another piece that starts out soft, with an oriental air to it, but then the drums kick in and the power is revealed, leading to another huge crescendo. Although each of these are between 1:49 and 2:10 long they make for great introduction tracks, and they help capture different atmospheres and game types. Are you looking to run something epic? Then begin the game with track 1 Return of the Solar Exalted. Mystery and darkness? That’s Track 3 Birth of the Liminal Exalted put to good use. Action and adventure? Track 5 The Getimian Exalted – War in Heaven would make a great intro. They may be short but they’re perfect for the game. Yes, you can probably loop them in the background and that should work out fine, and it’s a shame that they aren’t designed that way as I feel that a long, ambient background track would go a long way... however, the good news is that such a thing is in the works, so I’m looking forward to that. They are designed as short, punchy deliveries for each of the Exalts. They are designed to be inspiring, to give you that boost before play starts, or to give you inspiration when designing a game. Fanfare for the Chosen is an excellent soundtrack for one of the most popular roleplaying games on the market, and the music is suited to the gloriousness and the darkness of the setting. It’s another worthy addition to the RPG soundtrack collection and another excellent selection of music from James Semple. As I get older I find myself having less and less time to design, prep, and sometimes even run roleplaying games. As a result, I try to find games that are quick and easy to run, so that I can concentrate on what I think is important (such as the story and the unfolding plot) and less on the mechanics and statistics. Unless it's a game system that me and my group knows well I don't usually delve into my thick, comprehensive rulebooks that much these days. I have my favoured systems to introduce new players to the hobby, and these are pretty generic, but every now and then there's a group who wants to experience the system that dominates the RPG market; the D20 system. Or, to be specific, the D&D game. Usually I'd use the starter pack, but for those quick and easy games I've found a new and even easier system, one that emulates the D20 game and addresses some of it's key features, and yet is so stripped back that it takes no effort to set a game up. 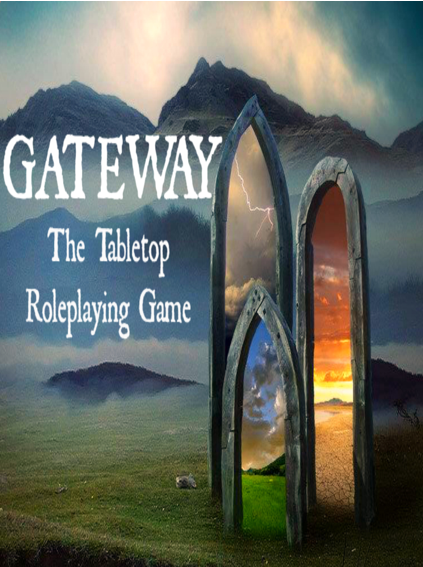 GATEWAY is an introductory game that takes the standard D20 stats and make them the key focus of the game. 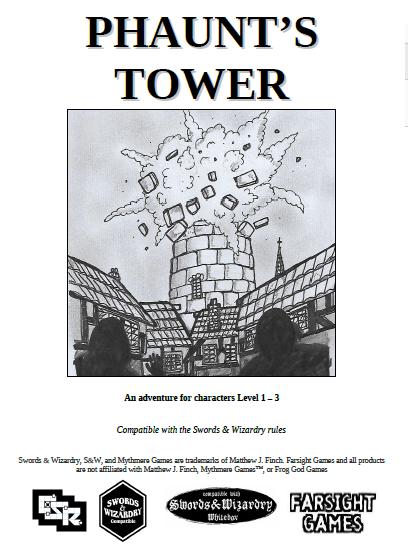 At 16 pages it covers everything you'll need to run a game, and not just in the fantasy genre. It's a really good little system. What stops it from being great is that it's lacking a lot of polish and some focus, and I feel a re-write and restructuring of the layout would help immensley. It works like this; a character has the standard D20 system abilities - Strength, Dexterity, Constitution, Intelligence, Wisdom and Charisma. Instead of being given scores, each is given one of three types of roll; Proficiency, Deficiency or Normal. Each ability is also given a selection of skills. When called upon to make a roll, the player rolls D20s; if they have a Proficiency in the ability, they roll two D20s and keep the higher result, very much like the D&D 5th Edition advantage roll. If they have a Deficiency, they roll two D20 and use the lower result. A Normal ability is a straightforward D20 roll. The target number is determined by the GM, from 2 to 5 for really easy, up to 20 for impossible. And that's it in a nutshell. 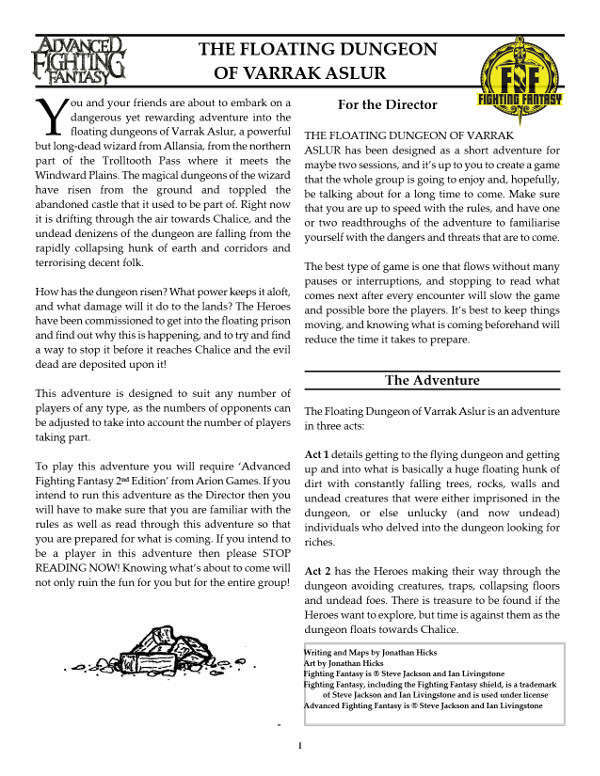 There are small tables for working out Armour Class and Hit Points, but in general that is the entire game, and as it's simple to print off you can have a small sixteen page document, or you can download it as an app and keep it on your phone or tablet. In fact, with a form fillable sheet and a dice rolling app there's no need for any pencils or paper, and interested parties can download the rules and be ready to go in a very short period of time. And the greatest thing of all? It's free. Now, I really like it. I like the idea of numberless abilities and using the proficiency angle as it just gives a dice roll and that's it, and even though you won't get an incredibly well-rounded character you will get a playable PC you can use for a few sessions. I like the simplicity of the rules and the idea that you can use it for anything, although I do feel it's more angled to fantasy games than any other genre, and I like the freeform feel of it all. It's a nice little system. But what lets it down is the presentation, both in the free downloadable rules from the Aurican's Lair website and in the app itself. 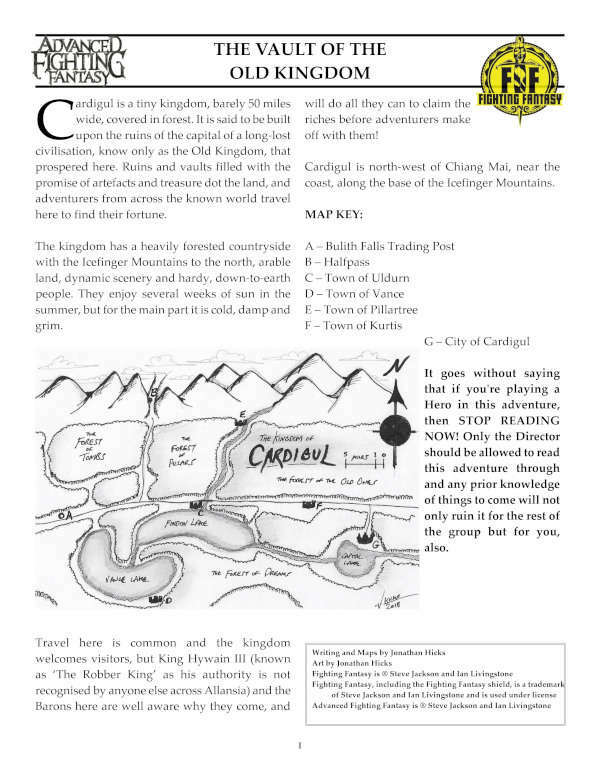 The rules are badly laid out in a very basic format, with some errors in the text, and the rules are spaced out in different areas which lends a little confusion, such as explaining how to roll against target numbers and then not having the target numbers explained until well into the rules section. There's also a lot of GM advice, but this is supposed to be a gateway into tabletop gaming so without a proper explanation of what tabletop RPGs are about these are somewhat superfluous. If the system is for existing GMs to use to introduce new gamers to the hobby, then this section is pretty pointless. There's also a lot of attention on the saving throws covering incidents from being blinded to being unconcious, and this seems like a lot of wasted effort and betrays the focus of the game - to be simple and easy - and complicates things somewhat. With some polish, some better imagery and layout, with a huge edit and much more focus on what and who the game is aimed at, GATEWAY could be an excellent introductory game, and may even be used for longer campaigns for experienced groups who just want to dive in and out of a game. It is a great little system, and it's one I have no problem in using on gamers who want to experience D&D or roleplaying in general for the first time, but the general presentation lacks finesse and may put some people off, and that's a shame because the core idea here is really quite good. Games and campaigns revolve around a core group of player characters all working together to either complete their own agendas or a larger quest. Usually, when the players are creating their group, they share out careers, abilities, and skills to make a balanced bunch of PCs who can handle almost every eventuality thrown at them by the GM. However, this may not always be the case. While players can work as a team and design their characters that way, they have almost total control over the creation of their PCs as far as personality, trade, and background is concerned. In some cases, GMs may ask the players to create whatever they like and then bring the PCs together in the first game. This gives the players free rein as to how they want their PCs to be, but can create a problem as to how these PCs come together. So, let's say the players have designed a group of PCs who comprise of a baker-turned-mercenary, a nurse, a noble from a high-born family, and a horse thief. What do these PCs have in common? At first, nothing. So, how on earth do you bring them all together? There's nothing more decisive than the Queen/Emperor/Ruling Faction pointing a long bony finger at the PCs and saying, for example, 'I command you to walk to the Ring of Fire and defeat this evil!' Already the PCs have been given a good reason as to why they should adventure together – they've been given their orders! The mercenary might go because that's his job. The nurse might go because the group might need aid on a perilous journey. The noble might go because, as a relation to the ruling body, it might be a requirement, a proving of the ability to defend the family/realm. The group has been given their orders by their ruler and will do all they can to win through, even though they are a mismatched group of PCs from very different backgrounds. It makes for excellent role-playing. It's also an excellent way to bring the PCs together and keep them together. Even though PCs may come from different backgrounds, it is still possible they might be friends. Although there might be a class system in effect in your game world, it is still possible that certain people might go against the grain and mix with whomever they wish and not with their social class or kind. The noble in our example group might be a man who likes to 'slum it', a PC of great esteem who dresses down and walks the lower streets of the city, mixing with what he would usually see as undesirables. In this group he finds new friends: a mercenary, a nurse from the local physician's guild, and (unknown to him) a horse thief. Alternatively, the mercenary could have gotten a job as a guard at the noble's castle, the nurse could work as a surgeon there, and the horse thief could 'work' in the stables. As the three mix on a daily basis they get to know each other. So, when disaster does strike or one or more of the PCs are drawn into a quest, the others are motivated or bound by loyalty to help. Something might happen to them all when the whole group is together and this gives them impetus, as a group, to set out on their quest. Let's say the PCs are all together in the Great Hall when an attempt is made on the life of the Queen. They might become the only witnesses who saw the assassin so they are sent as a group to track down the enemy. The PCs might come together because they are all after the same thing but for a different reason. They may be searching for a murderer, an enemy who has affected their lives in some way, or an item that has the ability to solve their particular problem. Each PC has their own agenda and reason as to why they are on the quest and they come together to benefit each other. This might be tricky. Of course, if they are all after the same thing, then when they do finally achieve it they will all have their own claim to it, especially if it involves an NPC. Unlike an object, which may be shared between the PCs, they will all want their own revenge or justice against the enemy – and there is only one of them to go around. This could make for a fantastically charged role-playing opportunity at the end of a long campaign, but it may be best to split enemies up and have them all part of a greater threat so that each PC has their own closure at the end of the game. So, for example, the mercenary may be after a man who killed his father, the nurse might be after the same man because he stole her family heirloom, a Pendant of Healing, the noble might be after him to stop him from threatening his borders, the horse thief might be after him because he has been hired to. Each PC has a different reason to go on the quest but, ultimately, they are after the same thing. A simpler way to get the PCs together is to have them all go on a quest for exactly the same reason. They can then work together and share any rewards reaped at the end. This can be anything from 'stop the bad guy' to 'find the treasure'. They all believe in the same thing and that shared belief brings them together. It could be a loyalty to a religion or figure of importance, or they know that there is a lot of gold to be made and it serves them all to work together and split the booty. A shared goal, especially when each player is aware that there is more chance of success in greater numbers, is a fine reason for them all to come together. For example, the PCs hear in a tavern that there is gold in them thar hills and they all share a common need for more gold. The mercenary is up for a quest because he knows his sword may be needed and wishes to make sure his skills are justifiably rewarded. The nurse might want money for her hospice and joins the quest to help finance it. The noble might join to increase the wealth of his family's and his personal coffers, and the horse thief might join because, hey – it's money, and it sure beats stealing horses. Wouldn't you believe it? The PCs are all in the same place when bang! something terrible occurs and they are all forced to work together to solve the problem. Don't you just hate it when that happens? Starting a game this way gives the PCs something to focus on straight away and also provides an excellent reason as to why they are required to work together. Each player has their own reasons and agenda, that much is sure, but when events transpire against them and they must rely on those around them then they will still have their illusion of free will but know they have to team up to survive or overcome the immediate problem. Once that problem is solved or avoided, then the PCs with their knowledge of the threat or problem can continue to work together. For example, they could be arrested together as scapegoats on a drummed-up charge, or be in the same village when it is attacked, or be in the same castle when it is besieged. Or, let's say the PCs are all journeying across an ocean on a huge passenger ship when suddenly they're attacked by the forward ships of an invasion fleet. The PCs, close together in a confined area, had to fight side-by-side to defeat the threat. The mercenary will fight because that is what he does. The nurse will fight to defend the wounded. The noble will fight because it might be his ship the raiders are attacking, and the horse thief might fight because where there are bodies, there's looting. Saving each other's lives or aiding in battle will introduce the PCs to one another and strengthen their new relationship. Although complete player control over the creation of a PC might be great for the dynamics of the character, it may present some problems the GM may have to overcome. As the game progresses, a player might decide to run their new PC as designed. Therefore, when certain things happen, the PC might not get involved because 'it is not in their nature to do so'. What can you do as a GM to get the player involved a little more? What they are playing the game for? It is a game of fun and adventure, after all, unless the group has something else in mind. If the player is going to refuse every road, avoid every danger, and otherwise do the opposite of what is required to complete the quest, then there's not much point in that PC being present. Bringing such different PCs together may present the players with some great role-playing opportunities. However, certain PCs from certain backgrounds might not get along for one reason or another. This may be fun but may also slow the game as PCs bicker and argue. To combat this, throw in a scene where two or more of the arguing PCs rely on each other to complete a task or save each other's lives. This will change the attitude somewhat and make for a great story. As campaigns come and go and new PCs are created the reasons as to why disparate PCs should come together might grow thin. Be careful not to repeat yourself or go over old ground. On the flip side, it may not be important to the plot – the players might just say 'yes, we're all different, but we're mates so let's get on with the game', which would be nice! Don't try to be too clever when designing the plot threads as to how the PCs are part of the bigger picture. Complicated reasons will slow the game as each PC will want time spent on their own dilemma independent of the group. This depends on the size of the group, of course, but it's best to try and keep it as simple as you can when first trying out this method of PC introduction. Run a single game for each player independently to come to grips with the PC's role and position. This takes up a lot of time and might be difficult to make sure every player ends in a position where they will serve the plot or even meet up with the rest of the group. This is the trickiest of the two and contains the most work for the GM. Spend a game or two actually introducing their characters and getting them entwined with the others before the big picture actually starts. This is easier and establishes a sense of group dynamic before the game starts proper. At the end of the day, the players are all at the table for the same reason: to take part in an adventure and have a good time. Considering the social aspect of the role-playing hobby, they'll probably want to just get involved and game together. However, adding reasons as to why the PCs have come together can help enhance the atmosphere and can also give you a backup in case the PCs don't mesh as well as you'd like. How grim is too grim? I'm writing an adventure for a dark fantasy game and I like the background blurb I've done; a few paragraphs describing the location, it's history, and what the adventurers find when they arrive here. I've talked a lot about the bleakness of the place and even offered some hints on just how miserable, damp and grey the location is. This is for a miserable, horror-laden scenario that I hope will tax not only the strength but the sanity of the player characters. Then I found myself editing a lot of the bleakness out; I read it back and part of me thought, 'How depressing - why would anyone want to play this?' It really was overbearingly miserable. I'm all for setting a scene, but not to the point where players walk out of the room crying after realising that their existence is pointless. I've got to strike a balance between what makes an adventure atmospheric and what makes it enjoyable. Yes, it's a bleak horror story but there can be a side to it for people to find the experience fun, but I think I have to trust the GM of the game to invoke that atmosphere, or at least invoke a level of grimness that the gaming group enjoy. After all, that GM knows his group and the group know what kind of game they want to play in. I can't impose my play style on people I've never met. All I should do is present my story and adventure and let the GM do the rest. In the end I've expressed the atmosphere in the intro and some of the background, and I'll no doubt use the words 'grey' and 'miserable' during writing, but I'll not enforce a type of game or a style of gaming that a group might not want to play in. That's not up to me. I realised today that I have no patience for statting out a roleplaying adventure. I love designing the plot, writing the story, creating the characters and fleshing out the adventure, but when it comes to giving the main NPCs and monsters statistics based on the system and the experience of the characters the adventure is designed for, I simply slump my shoulders and press on. To me, statistics are a part of designing adventures that feel like a chore. All I'm interested in is the situation and how the players react to it. I like introducing new elements to a story as it progresses, twists and incidents that might bring out the player's characters, create in-game tension around a table, or get a few pulses racing. But when it comes to statting a character... I always leave it to the end as I don't want the wind taken out of my sails as I'm writing. They're usually adjusted after playtesting, anyway. I guess it's because of my background of fiction writing and, of course, you don't have to worry about a character's stats. You just want to get on with the story. I'm a huge Warhammer Fantasy Roleplay fan. I wrote an article a few years ago about my top ten RPGs, and WFRP's position at the top hasn't changed since then. I'm really excited that Cubicle 7 are going to release a new Warhammer RPG, using elements of the first two editions. They're also doing a game for the new Age of Sigmar which I will no doubt purchase as I'd love to see how they handle the RPG aspect of such a huge setting. I'm still not happy about the whole End Times thing, and the destruction of the Old World and pretty much everything and everyone in it was just ridiculous, but the Age of Sigmar wargame is really good and very playable, and the setting itself is pretty good, if not to my taste of fantasy setting. 1st Edition will always be my favourite for the reasons above, and as much as I liked 2nd Edition - especially the rules changes - it never had the same atmosphere as the original. The 3rd Edition I never owned but I played a few times and it was fun, but there was never any longevity in the games and it felt more about the components of the box than the actual story, and that belongs in a boardgame. Until that happens we have a Warhammer-esque game created by Warhammer fans, a retrocolone-homage-restyle-oldschool-heartbreaker-fan version of the game I hold very dear to my heart: ZWEIHÄNDER. I've been reading the PDF of the game with clenched jaw and nervous twitches, wondering just how the guys at Grim and Perilous have changed the game to my dissatisfaction but up to yet I've been really, really pleased... no, impressed by what they've accomplished. The art choice, the design, the details, the rules have all been heavily redone. It's not a reskin or a filing off of serial numbers, it's a full game of a professional quality. I don't review PDFs, but I will have the physical book soon so I'll have a proper review done in next few weeks once I've had time to digest it and try it out. Do I have issues with it, being the Warhammer fan I am? Yes, of course I do, but I'm reserving final judgement for when I have the book in my hands to make sure that my issues are justified, and not just confused by initial reading or the problems I have with PDFs. Safe to say that I think any problems I do have are going to be outweighed by the good things I have to say, but I'll save all of that detail for my review. ZWEIHÄNDER is a game to get excited about, whether you're a Warhammer fan or not, and Grim & Perilous should be proud. 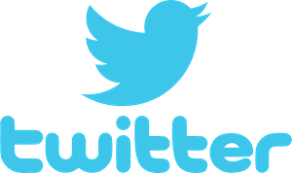 Check back regularly for my full review. I've had a long time away from Farsight Blogger. I never intended to get fully back into it but with major things going on in the industry, and my own work starting to take on a life of it's own, I've decided to start it up again. So what have I been up to? 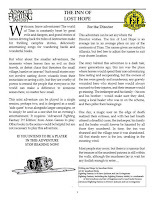 Well, I did some work on Advanced Fighting Fantasy 'Stellar Adventures' which was released earlier in the year and did well. A lot of my work wasn't used, but the game has my name on it and it was gratifying to see that; it was Fighting Fantasy that got me into this hobby and to see my name on an official product is just amazing. I'm also working on other writing projects, and getting back into my art, and that's another reason I'm restarting this blog. I'd like to share what I'm working on, give progress reports, and explain why I make certain decisions during the process. As far as the wider hobby is concerned, there's a lot going on that I'm excited about. Primarily, my favourite fantasy RPG is getting all kinds of love. Warhammer Fantasy Roleplay is making a return in more than one iteration. First, there's the retroclone ZWEIHÄNDER, a huge tome giving us classic WFRP rules with a twist, but setting neutral. It positively drips grimness and I love what I've seen up to yet. There'll be a full review of this soon. On top of that, Cubicle 7 are releasing their own WFRP under license from Games Workshop, allegedly a mix of first and second edition. Not only that, they're doing a seperate RPG for Age of Sigmar, the epic wargame setting that replaced the Old World after it was utterly destroyed, something I'm not bitter about at all. The bastards. I'll be following these developments. and others, as well as getting new reviews in as well as interviews, three of which I already have planned and hope to share soon. I'm happy to be back on Farsight Blogger. Hopefully I'll be able to mix things up a bit but I'm not making any solid plans. I'll just set out, and see where it takes me. There's far too much going on in the hobby for me to stay away from blogging. There's people I want to interview, things I want to review, and my own material I want to show off. Time to get Farsight Blogger back in the game. A lot of gamers want to game in the fantastical, but gaming in a contemporary setting is a mirror of real life, so you have to ask the question - what's the point? I've combated that by placing the players in a setting they hardly know from experience, such as a Vietnam game and special ops in South America. Removing the players as far as possible from their real life environment can be as effective as placing them in a fantasy world. Because the world you are in does not require a lot of imagination (as the details/settings/items are all provided for you) it can be difficult for the GM to maintain that suspension of disbelief. In a fantasy setting, the players know none of it is true and they allow themselves to be immersed in the setting. With contemporary games, the real world can pretty much drag the players 'back to reality', and they can feel the limitations and constrictiveness of normality. To combat this, I try to keep the game moving at a good pace. This is possible because I don't have to spend time describing the appearance and function of many of the items and locations. If you can't keep the game going with atmosphere then keep it going with plot and action. The problem is, burn-out usually tends to come sooner rather than later because of the pace. The players may feel restricted in their actions and capabilities because they are within a real world environment where all those real world rules and regulations are going to apply. So, the players will have to be wary of actions involving the police, their own skills, and the impact of their actions (because the GM is more likely to realise the effects in a world they know inside-out). Also, most gaming systems I've come across reflect this real world feel, where there is great danger in over-zealous actions and a high payment (death) for certain mistakes in judgement or hits from weapons. With these kind of restrictions, the players will soon get bored, tired, or frustrated. My answer to that is to throw out the rule books. Be more forgiving to the players, allow them to do James Bond-style stunts and Indiana Jones-style rescues. The more latitude they are given, the more 'into' the game they will get. Most games in contemporary settings are a mixture of the real world and the fantastical, involving alien conspiracies, vampires, magic, and great old gods come back to reclaim their world. This is good news because it puts the players within a familiar environment whilst allowing their imaginations to work on the fantasy elements of the game. However, the game can be limited because the game world limits the exploration of the chosen genre. How many vampires can you dust in different ways before it gets repetitive? How many times can the "truth" about the government conspiracy slip through your fingers before you just give up? How many sacred artifacts do you have to recover before you begin to think "hold on... this is all very familiar"? Once you've defeated the foe and saved the world - where do you go from there? A great way to get past this problem is to have a deep well of imagination, which is why I started GMing in the first place! Fantasy and Sci-Fi games open up many possibilities in their own realms of fiction, but contemporary games consist of the same setting, the same world, the same attitudes. This can limit the adventure, sure, but it can also help you in your quest for a new idea. After all, the world is set and you already have your guidelines as far as the setting goes - all you have to do is come up with the plot. Sure, the game may be another murder-mystery, but it's the reason and circumstance surrounding the murder that makes it unique. My favourite idea is turning the world up on its head. A vast plague leaving few survivors, a new Ice Age, a holocaust, an alien invasion, the Rise of the Machines... You take the world and twist it all out of sense and proportion. This works great because then the rules don't apply any more. There's no restrictions on society or law, and you can change the rules to reflect that.